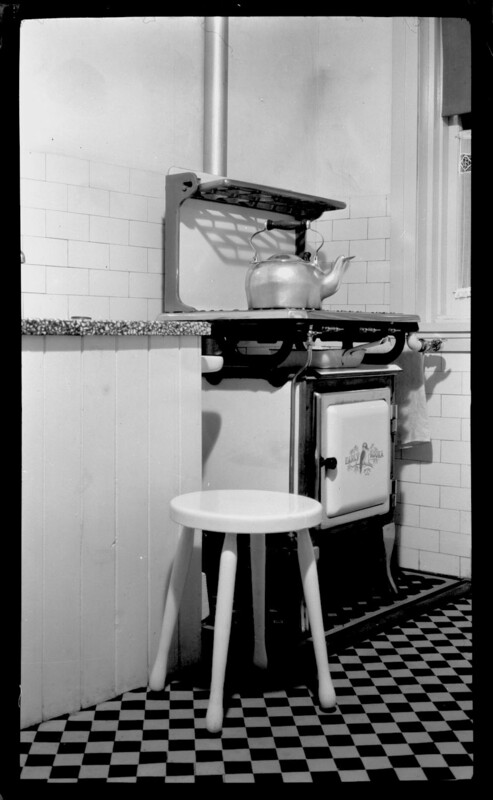 The Alan Spearman Evans Collection comprises over 2000 photographic images of houses, house interiors, garden landscapes and industrial workplaces in New South Wales, taken by Alan Spearman Evans between 1924 and 1957. The photographic images are in various formats including photonegatives (21 boxes), silver gelatin photoprints and 35mm slides. The photonegatives are stored with the original envelopes annotated by Evans and provide an historical record of photographic documentation – often providing detail on aperture settings, light conditions and type of film used. The collection also includes family and general correspondence, property valuation certificates, the published book ‘Tail Up’ written by Sylvia Evans, a personal notebook and scrapbooks of newspaper clippings. Alan Spearman Evans (1902-1963) was a Sydney-based amateur photographer who spent much of his life recording his houses, gardens and workplaces as well as those of his family and friends. 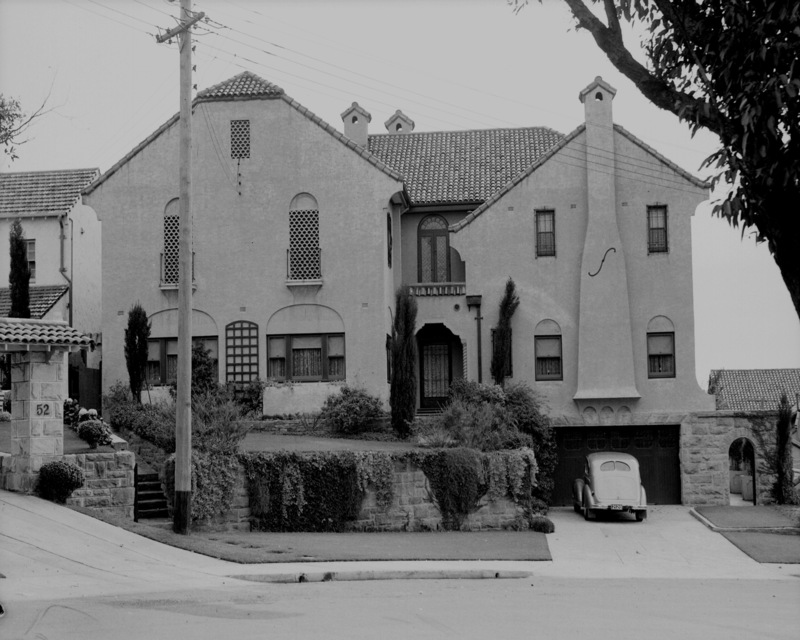 Evans married his childhood sweetheart, Sylvia Winifred Henderson (1902–1995), in 1927, and together they built their first home, Alwyn, in Arncliffe, in south-west Sydney. Photographing the construction of the house from its earliest stages, Alan initiated a routine of documenting the homes of his family and friends that would continue for over 30 years. Employed as an accountant for Davis Gelatine (Aust) Ltd, Evans took his photographic hobby into the workplace, capturing images of the extensive Davis Gelatine industrial garden and factory complex in Botany. He was also photographer for the company newsletter Davis Gelatine Review. In 1933 the Davis firm leased the Cockatoo Island Dockyard in Sydney and Evans documented ship-building activity and ship launches there. In 1944 Sylvia Evans published her book, Tail Up, illustrated with Alan’s photographs, and this, along with related correspondence, provides a curious insight into their lives at Arncliffe as seen through the eyes of their cross blue heeler/kelpie, Manna. 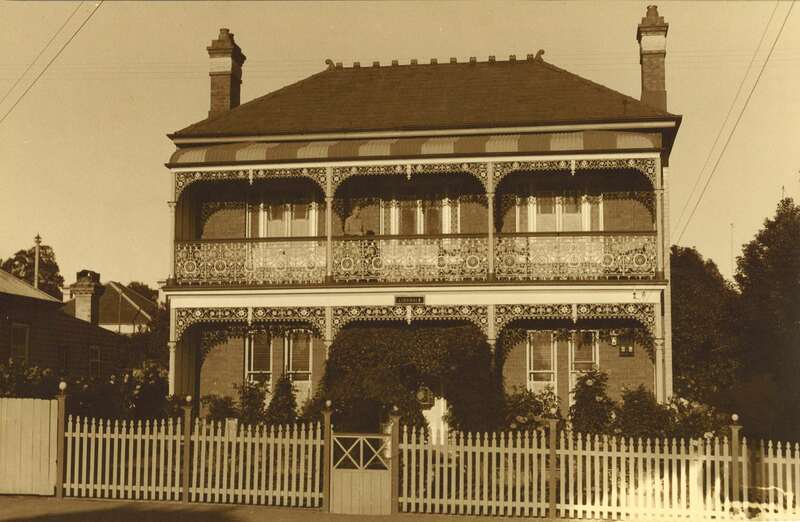 Manna died unexpectedly in 1946 and the devastated Evans’ named their next property, in Mosman, Manna House in memory of their beloved kelpie. 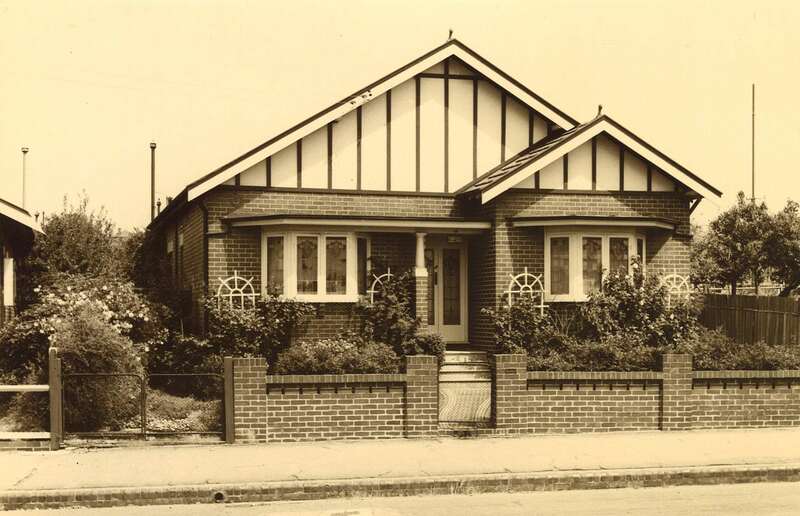 Alan and Sylvia moved into Manna House in 1950 and Alan continued to document the house and garden until his death in 1963. Sylvia stayed in the house they had built together for another 30 years. For more information about Alan and Sylvia Evans and the photo collection, see the story, A window to the past. Parts of the Alan Spearman Evans Collection were acquired between 2006 and 2008 on eBay and a subsequent direct purchase from the dealer of those parts of the Evans material relating to houses, interiors and gardens. It is believed that the material was originally disposed of following the death of Sylvia Evans in 1995. The extent of the original collection is unknown but many images relating to Cockatoo Island, other industrial sites managed by the Davis firm, some domestic photographs, and personal correspondence are known to have been dispersed via eBay. Given the haphazard nature of the disposal and subsequent acquisition of the Evans collection, the Caroline Simpson Library & Research Collection (CSL&RC) is responsible for the current arrangement of boxes and folders. For more information about Evans material held by other institutions see the list of related material below. The Australian War Memorial has acquired images of shipbuilding at Cockatoo Island taken by Evans and a photo album of the construction of an air raid shelter at the rear of Alwyn, 16 Loftus Street, Arncliffe (see Evans Collection: EC3/ALW for CSL&RC holding of negatives). This material can be accessed through the Australian War Memorial catalogue. The National Archives of Australia holds a collection of images taken by Evans of shipbuilding activity at Cockatoo Island. Records of these images are available on the National Archives PhotoSearch catalogue. The State Library of New South Wales has Photographs and scrapbooks of Cockatoo Island Dockyard, 1935-1943 / compiled by Norman Frazer and contains many photographs taken by Evans. Mitchell Library PXE 776. Sydney Living Museums (formerly The Historic Houses Trust of New South Wales) manages Vaucluse House, Vaucluse. Detailed information is available on this website. The New South Wales Heritage Branch has records of a number of properties photographed by Alan Evans on the NSW Heritage Database. Included in this series are scrapbooks of newspaper clippings, a personal notebook kept by Alan Evans as a young man, and photograph album pages documenting the Alwyn garden and social outings with family and friends. A double-page spread from Alan Spearman Evans' notebook. The inside cover of Alan Spearman Evans' notebook with a photo of his wife, Sylvia. This series contains general correspondence and ephemera relating to the published book Tail Up written by Sylvia Evans. Included in this series are valuation certificates, April-May 1943, and pages from photograph albums of the properties owned by Sylvia Evans’ father, James John Henderson, in Arncliffe and Blayney. This series also includes house plans of 34 Killarney Street, Mosman, the home of Sylvia and Alan Evans, 1950 -1995. 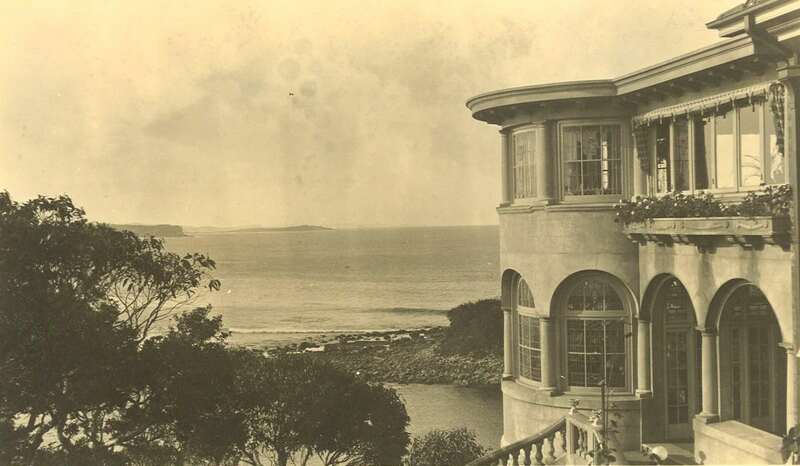 Danehurst, 50 Bower Road, Manly, N.S.W. – Residence of the Burnet family Black and white photograph of front of house from street. James John Henderson Properties ‘Omagh' and ‘Iona’, Osman Street, Blayney, N.S.W. ‘Wyandra’, Carcoar Street, Blayney, N.S.W. ‘Enniskillen’, Smith Street, Blayney, N.S.W. ‘Achetee House’, 8-10 Victoria Street, Arncliffe, N.S.W. 'Rockmoor’, 14 Victoria Street, Arncliffe, N.S.W. ‘Trentham’, 3 Kembla Street, Arncliffe, N.S.W. ‘Stanroy’, 42-44 Bayview Street, Arncliffe, N.S.W. ‘Lidsdale’, 8 Kembla Street, Arncliffe, N.S.W. Alwyn, 16 Loftus Street, Arncliffe, N.S.W., 15 October 1944. 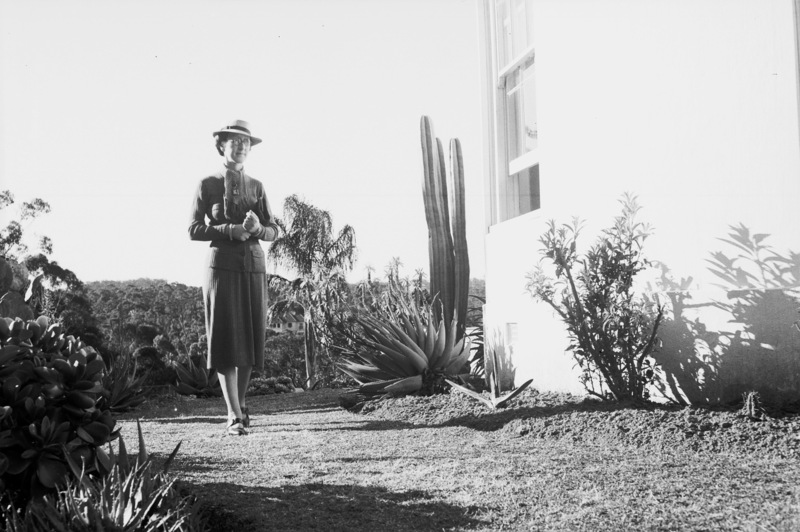 Alan Evans married his childhood sweetheart, Sylvia Winifred Henderson (1902–1995), in 1927, and together they built their first home, Alwyn, in Arncliffe, in south-west Sydney. 'Alwyn' was an amalgam of their names Al (Alan) and Wyn (short for Winifred). Photo Alan Evans. 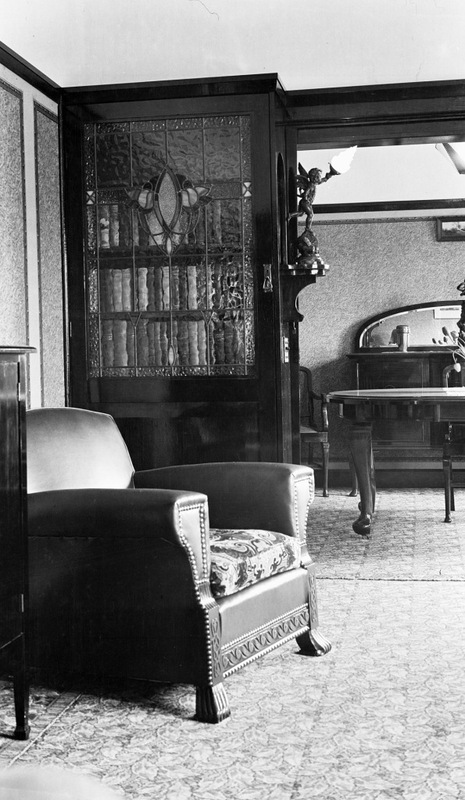 Evans Collection, Caroline Simpson Library & Collection, Sydney Living Museums. EC23/ALW/P/26-29/27. Danehurst, Bower Road, Manly, N.S.W., no date. 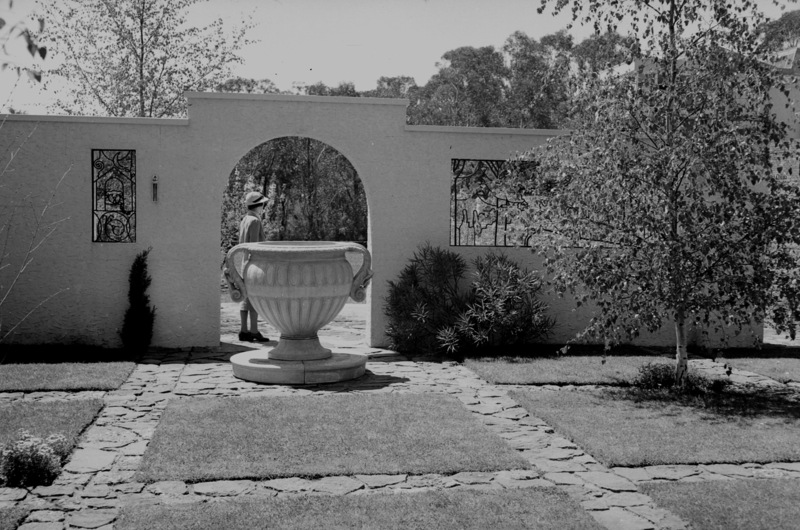 The courtyard at Everglades, Leura, October 1938. Photo Alan Evans. Evans Collection. Caroline Simpson Library & Collection, Sydney Living Museums. EC23/EVE/P/2. Photo Alan Evans. Evans Collection. Caroline Simpson Library & Collection, Sydney Living Museums. EC23/HEN/P/10-25/22. 34 Killarney Street, Mosman, N.S.W. ‘Mother’s is in the wall to the right of the gate. 12th in the top row’. ‘Mother’s is 12th from the left in the top row (marked with a cross). The gardens and surroundings are beautiful just now’. 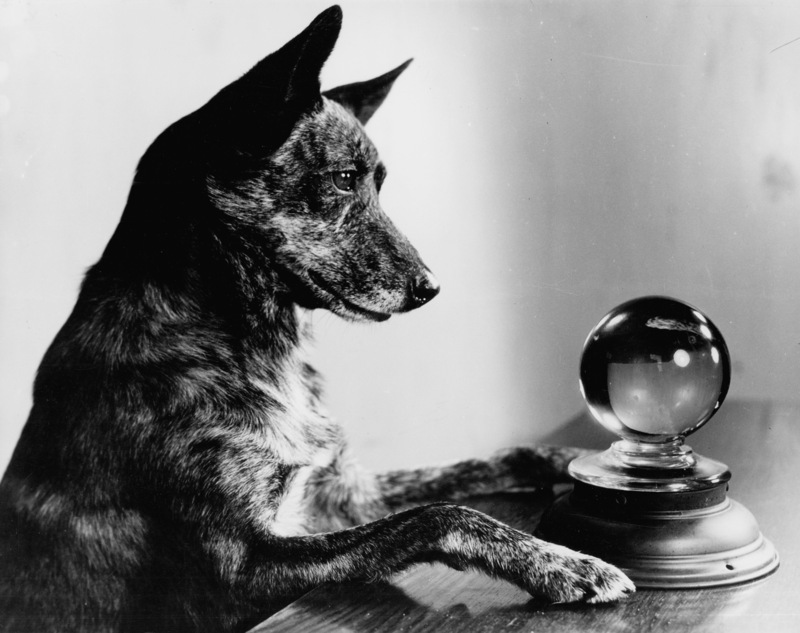 Manna, the Evans' pet dog, no date. 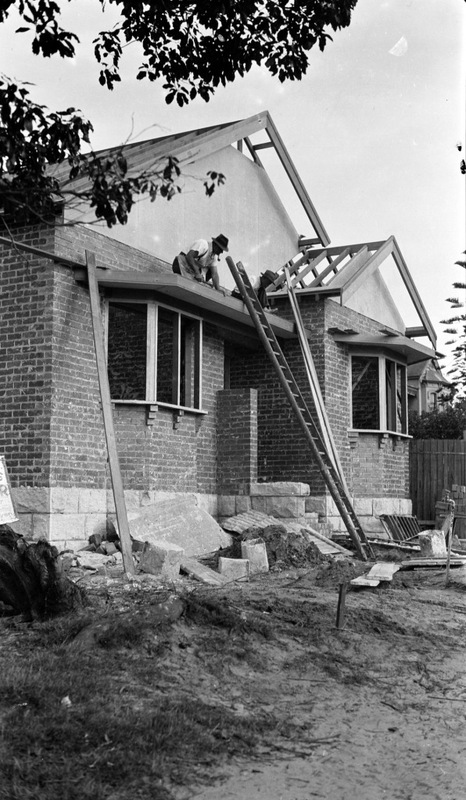 Manna House, 34 Killarney Street, Mosman, N.S.W, mid 1950s. Sylvia Evans, Beatrice Tange (accompanist and wife of H.J. Evans), Gracie Fields, H.J. Evans. 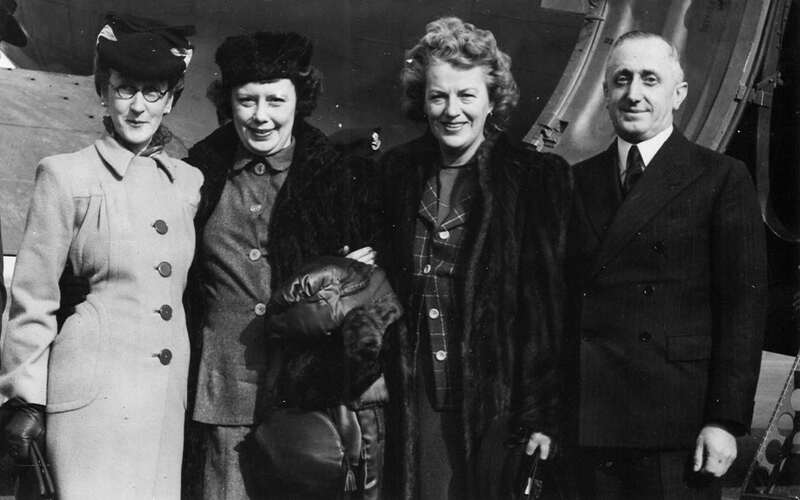 Gracie Fields departing Sydney after her ‘triumphant Australian tour’, 1945. This series includes photonegatives and contact prints of properties, family and friends, photographic art, garden landscapes and industrial workplaces. Construction of 'Alwyn' at 16 Loftus Street, Arncliffe 1927. Sylvia Evans on cane lounge, Alwyn, c.1930. Photo Alan Evans. Evans Collection, Caroline Simpson Library & Research Collection, Sydney Living Museums. EC4/ALW/N/78-87/78. Properties, 1938-1941 Everglades, Leura Views of and around Duntry League [Duntryleague] Feltex House, head office of Felt and Textiles of Australia Ltd, cnr Jamison and George Streets, Sydney Burnham-Thorpe - home of John Woolcott-Forbes, Gordon, N.S.W. Visit to Mr and Mrs G.T. Marshall, Mudgee, N.S.W. A.J.Allingham’s home Red Cross Fetes, Lady Fairfax Residence, Wentworth Road, Double Bay, N.S.W. 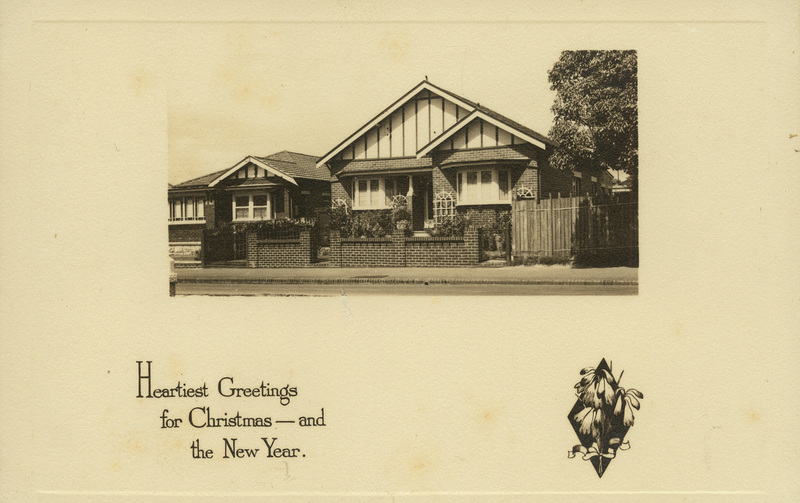 Properties, 1942-1951 Ivor Machin & family, 132 Fullers Road, Chatswood West, NSW Fete at Fairwater, Wentworth Road, Double Bay, N.S.W. Ray Thomas with wife and son Stephen ‘Manna’, 34 Killarney Street, Mosman, N.S.W. Photo Alan Evans. Evans Collection, Caroline Simpson Library & Research Collection. EC10/PAL/NCP/28-31/31. 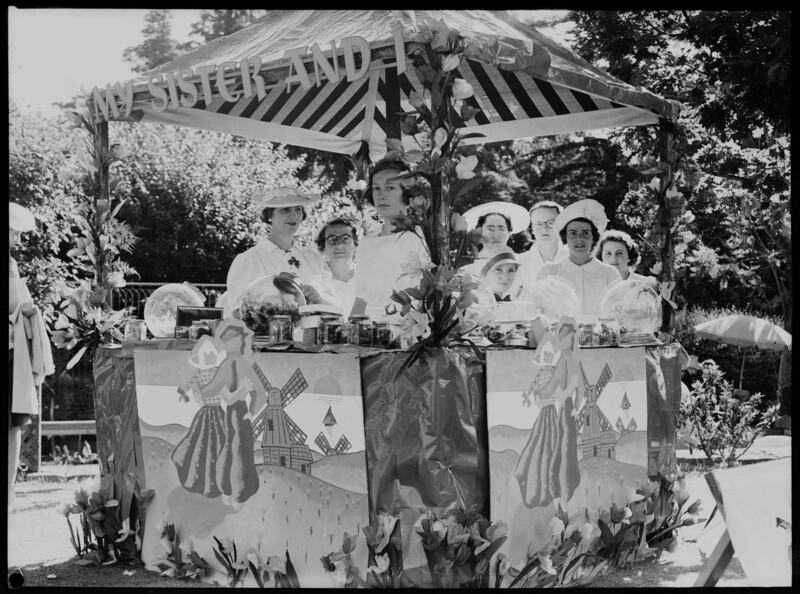 'My Sister and I', Red Cross Fete at Fairwater, the home of Lady Fairfax, Double Bay, 21 November 1942. 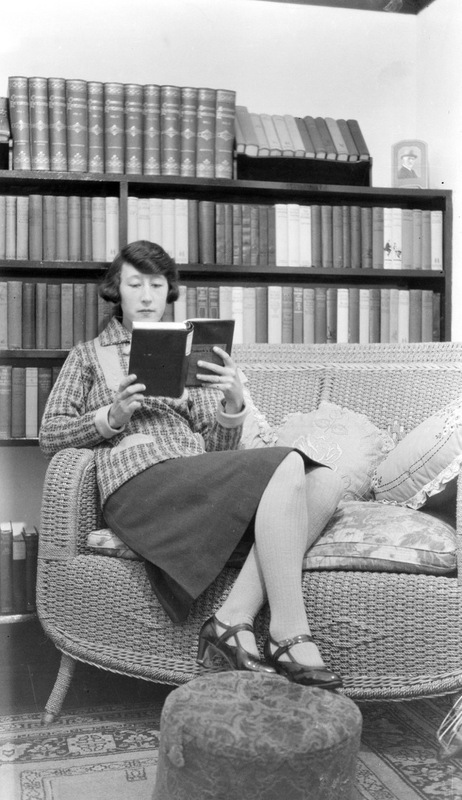 Sylvia Evans at Burnham Thorpe, Gordon, 5 October 1940. 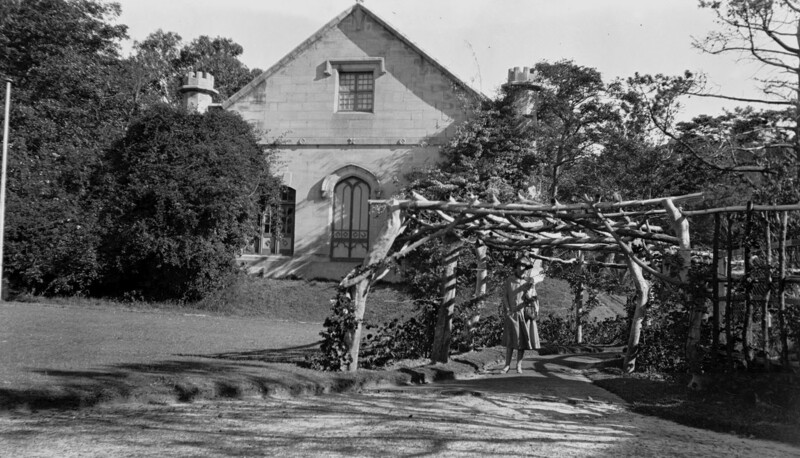 Sylvia Evans under the rustic pergola at Vaucluse House, c.1926. 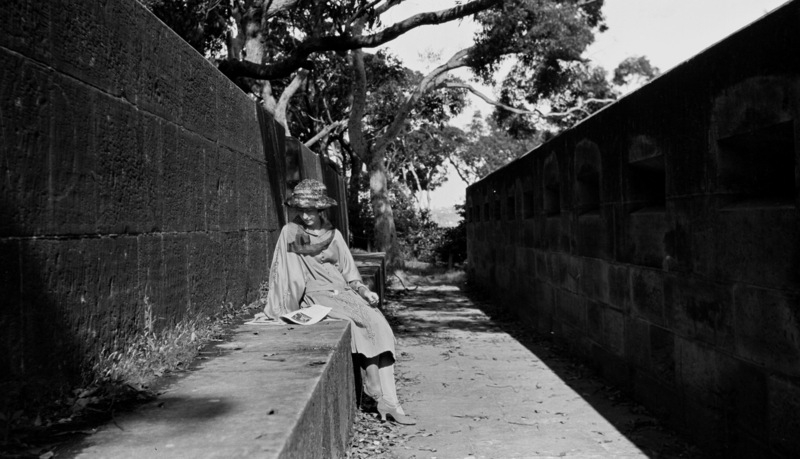 Sylvia Evans at the Bradley’s Head Fortification, Mosman, c.1930.